Episode 1 "Adam Ruins Having a Baby"
Episode 2 "Adam Ruins Weight Loss"
Episode 3 "Adam Ruins the Hospital"
Adam Conover explains that inflated hospital costs have created a system thats unaffordable and unfair. Plus, the reckless prescription of antibiotics is making them worthless, and you might not need a mammogram. Episode 4 "Adam Ruins Dating"
Episode 5 "Adam Ruins Fine Art"
Adam poses the question of what makes great art and shows why pieces visible to the masses are revered, regardless of artistic merit. He then exposes the masters as copycats and reveals that todays art market is a moneymaking scheme. Episode 6 "Adam Ruins What We Learned in School"
Adam shows that Columbus didnt discover America, King Tut was a dud and the rules of grammar are not as ironclad as people think. Episode 7 "Adam Ruins College"
Episode 8 "Emily Ruins Adam Ruins Everything"
Episode 9 "Adam Ruins His Vacation"
Episode 10 "Adam Ruins the Suburbs"
Adam explains how the idealized lawn is an unnatural monstrosity, and that the design of the suburbs is slowly killing you. Plus, the racist history of suburban planning led to todays institutionalized segregation in schools. Episode 11 "Adam Ruins the Economy"
Adam explains why lobbying makes filing your taxes so complicated, and why the economic numbers we focus on dont provide the whole story. Plus, American manufacturing cant come back because it was a fluke to begin with. Episode 12 "Adam Ruins Conspiracy Theories"
Episode 13 "Adam Ruins Wellness"
Pricey "detoxifying" treatments cleanse you of cash (and may do more harm than good), while MSGs scary reputation is undeserved. Plus, the placebo effect is way more powerful than you think! Episode 14 "Adam Ruins Halloween"
Adam reveals why you have nothing to fear from strangers with candy and how the "panic" over Orson Welles War of the Worlds broadcast was the clickbait of the 1930s. And, mediums and sances have a long history - of being fake. Episode 15 "Adam Ruins Science"
Testing mice means wasted resources because what works on them often fails on humans. Scarce funding stops scientists from seeking cures, and theres no money in reproducing results, even though its essential in proving findings. Episode 16 "Adam Ruins the Future"
Adam explains that unregulated food expiration dates lead to waste and that your 401(k) wont be enough to support your retirement. Plus, Adams girlfriend Melinda proves that even with research, the future is unpredictable. Episode 17 "Give Me Liberty or Give Me Truth"
Adam Conover undermines everything you thought you knew about the American Revolution with startling facts about George Washington, Paul Reveres overrated ride, and the tale of a slave who helped America win. Episode 18 "The First Factsgiving"
The Pilgrims didnt break bread with Native Americans, but did dig up their graves! There was no romance between Pocahontas and John Smith, and cities in the New World rivaled London in scale before their "discovery." Episode 19 "Mutually Assured Ruination"
Episode 20 "An Ancient History of Violence"
Episode 21 "The Copernican Ruin-aissance"
Episode 22 "100 Years Ago Today"
Episode 23 "Adam Ruins Guns"
In this episode, Adam takes aim at critics on both sides of the gun debate in America, from assault-weapons bans to racism to the Second Amendment. Episode 24 "Adam Ruins Sleep"
Adam Conover dispels widespread misconceptions about sleep. 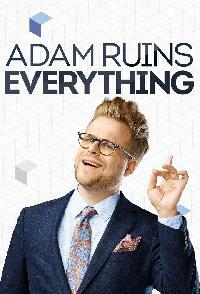 Episode 25 "Adam Ruins Tech"
Adam Conover dispels widespread misconceptions. Episode 26 "Adam Ruins Flying"
Adam causes turbulence when he reveals that reward miles drive up costs, and revisits the "golden age" of air travel to uncover smoky, sexist death traps in the sky.